Earlier this month, an announcement was made at the KC Game Fair that a new RPG company had been founded by Frank Mentzer, Tim Kask, Jim Ward and Chistopher Clarke. The name of the company is Eldritch Enterprises and will work to publish projects by each of the founding authors. Jim Ward has been suffering from health problems lately, but hopefully he will recover soon. The project that we have heard most about so far, and which is what I am most excited about is Frank Mentzer's Aquaria Campaign, which I at some point hope to incorporate into my Blackmoor campaign. Currently Eldritch Enterprises are working to set up a new website for the company. 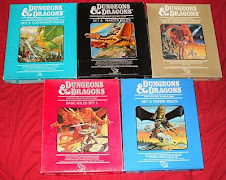 Before even having a name, the company was criticized in the Grognardia blog for possibly not being Old School enough. Let's give the guys a chance before we shoot them down shall we? To find out more about what Eldritch Enterprises are up to, feel free to visit the Aquaria Forum over at the Piazza. I must've missed this. This is great news! I can't wait to see what comes out of this! I spent quite a bit of time with Tim, Frank and Chris in that same spot pictured a few summers ago at a Troll Con. Very nice guys. I hope they are a smashing success!